Touchpad is one of the most important parts of your laptop. It helps you navigate the mouse pointer on your laptop screen. There are some people who do not use it and find it uncomfortable. They use regular sized USB mouse for better comfort and flexibility. Many of the laptop users may face a problem where their laptop touchpad fails to respond or stopped working. So here I will provide the various solutions to make your laptop touchpad work again. Here are the various solutions that will help to fix your laptop touchpad and make it work again on your laptop. 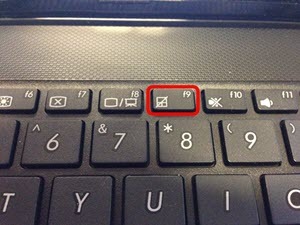 Most of Laptops have a physical button or Function Key combination on keyboard to turn the Touchpad ON or OFF. It may be possible that you have accidentally turned Off the touchpad and this causes it not to work. So just check the touchpad button or keys and enable the touchpad by pressing the touchpad ON / Off button or by pressing the Function Key (Fn) + Touchpad Key present on your laptop keyboard. Sometimes in Windows, due to unknown reasons the touchpad may stop responding in the middle of work and for this you may have to restart your Windows operating system. If restarting does not solves your problem then proceed to the below mentioned solutions. Some laptop touchpad requires drivers for their working so if your laptop comes with drivers installation disk (CD/DVD) then install the touchpad drivers using it. Also if you have upgraded to higher version of Windows then also you may have to install the touchpad drivers of your laptop. You can find the laptop touchpad drivers on the internet on your laptop’s manufacturer website. If all of the above solutions are not working for you then it might be possible that there is a hardware failure with your laptop touchpad and you have to get fixed or replaced at your laptop’s authorized service centre.